There are some small, quite bothersome discrepancies with SBrightmaps and your spritefixes (Cacodemon's face, arachnotron's eyes, lack of brightmaps for the new zombie rotations) I'd ask for Z86 to update them but it seems he isn't around anymore. Would you be able to fix this please? @Zenon SBrightmaps is a few years old now and was based on the vanilla sprites, hence the wrong offsets. NightFright made a newer Brightmaps pack which also includes (optional) brightmaps for textures and the option to switch between vanilla and spritefixed brightmaps. Sadly, the dropbox link to the latest version expired, you could ask him to reupload it. 1.5? I thought 1.41 was the latest version. At least, that's the most recent one I got. It's hard to keep track of it since afaik NightFright has no special thread for them, but occasionally sprinkles them in Marphy's/Revenant100's Sprite Fix thread on Doomworld. I am releasing a new version of the spritefix brightmaps today. Main focus was on optimization, nothing ground-breaking new. The pack is a lot smaller now and some of the powerups look nicer (e.g. only the eyes of the Mega-/Soul-/Invulnerability Spheres are highlighted instead of the whole item). A few brightmaps I removed because they were kinda unnecessary and made the sprites look too bright. Prepare for another bigger update of the pack next Monday (April 8). 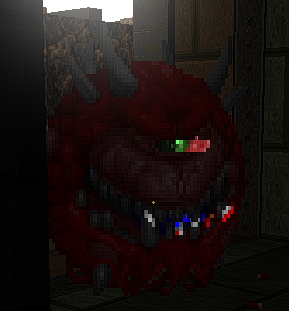 - This pack replaces GZDoom's brightmaps.pk3 completely. DO NOT use both files at the same time! Hopefully this will be the last update (unless new spritefixes require more adjustments). I have finally removed colors from Doom and Heretic brightmaps which caused overbright colors until now. This makes sprites look more authentic and brightmaps effects also more subtle in many cases. I also compared all existing brightmaps with those from GZDoom's brightmaps.pk3, always choosing the best version. This should be the best-looking brightmaps pack yet! They probably wouldn't want the texture brightmaps, but the rest should be pretty usable. I'd like to have an ingame menu option so you can switch between the spritefix and normal brightmaps on-the-fly, but I dunno if that's technically possible. Wouldn’t it be better to make a separate topic for the brightmaps pack, by the way? Do you know Sgt. Shiver's Shazam for Heretic? It basically adds idle sounds and unique graphics to all tomed weapons that lack them. Unfortunately, they are based on the erroneous vanilla sprites. Could you make a patch based on your sprite fixes? Undead wrote: Wouldn’t it be better to make a separate topic for the brightmaps pack, by the way? I remember seeing you ask about that before and thinking "I could probably do that myself", but I didn't. But this time I did. This is a great fix, Marphy! I think you did a fantastic job. May I give these projects 5/5 stars each?